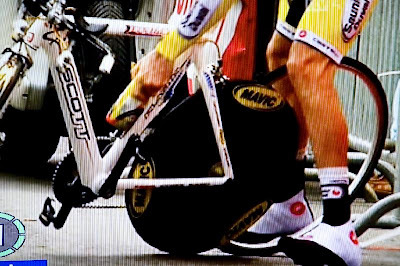 Not exactly sure what's going on with this disc wheel, but that's more than just the tire falling off. 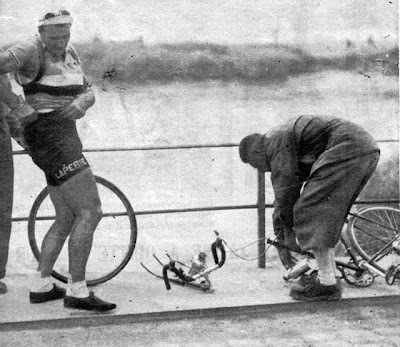 In a time before carbon fiber, when steel, lugs and drillium was king, bicycle failures were common. It's just that nobody was blogging about it. Olympic skier Todd Lodwick was involved in a head on collision with a car while descending the Col de Les Saisies, after watching stage 17 of the Tour de France. 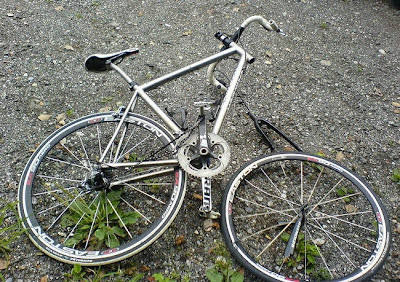 He broke his carbon fork and the windshield of the car, but somehow, he is fine. Full Story. 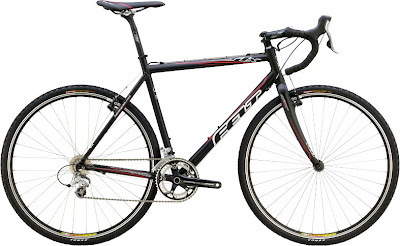 Felt is recalling all 2007 & 2008 F1X Cyclocross bikes due to the failures of the carbon fork. Six failures have been reported, 2 with minor injuries. Full store here. I'm back, summer vacation is over. Time to start breaking that carbon again. Jack sent this one in with no story. This warning is on the fork of my wife's Norco CCX cyclocross bike. This fork is only to be used for normal road riding. It has not been designed to withstand the stresses of off road riding. Use of this fork off road is not safe and could could cause sudden and catastrophic failure. For more information, please contact your dealer. 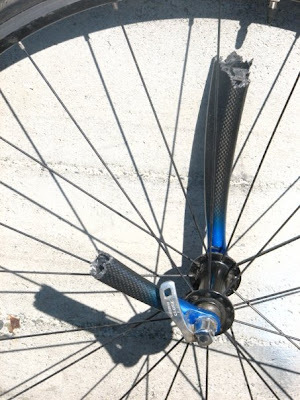 A cyclocross fork that is unsafe for off road use, what is the point of that? 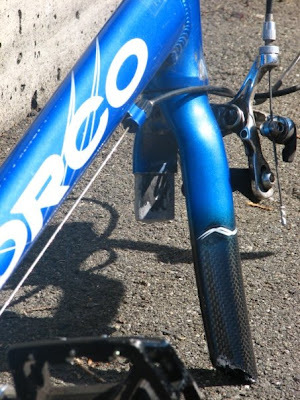 At least Norco is honest that their carbon forks are junk.